In May 2005 I took my younger brother up the west fork of the Gila River into the Gila Wilderness. Right away we came upon this decent-sized gopher snake (Pituophis melanoleucus). 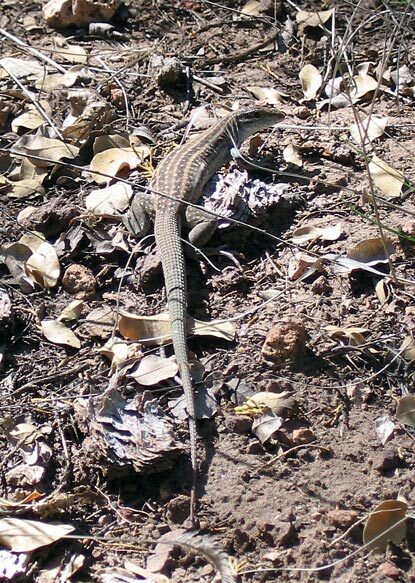 Next up was this Gila spotted whiptail (Cnemidophorus flagellicaudus). It looked to be close to 9 inches long including the tail, and it was definitely a female. This species has done away with males altogether and reproduces parthenogenically. 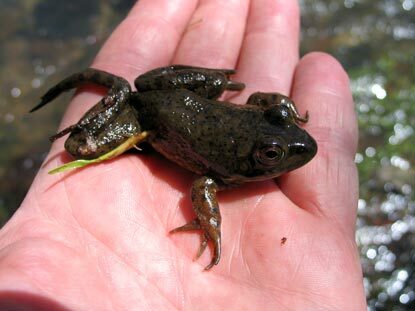 The river is infested with bullfrogs (Rana catesbeiana). Not good news for the native species. We were sitting on a rock bar in the middle of the river eating lunch when this monster gopher snake pulled up right next to us. 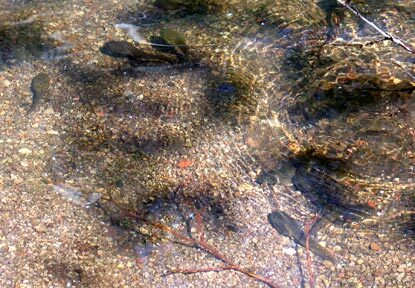 Huge bullfrog tadpoles in a side pool off the river. You are looking at the culmination of my life as a herper. 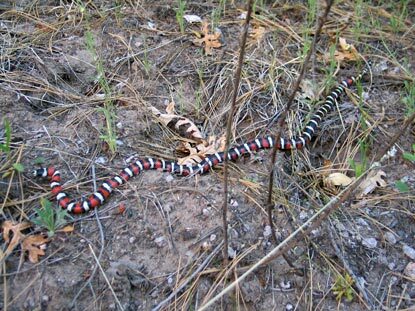 Ever since I saw a picture in my first field guide when I was 8-years-old, I've wanted to find a mountain kingsnake. This particular beauty is a Sonoran mountain kingsnake (Lampropeltis pyromelana). For me this is the holy grail of North American reptiles. I found the snake just like this, right next to the trail and bright as can be. I was over the moon and practically in tears. They really don't get much more beautiful than this. Definitely the highlight of my herping career. 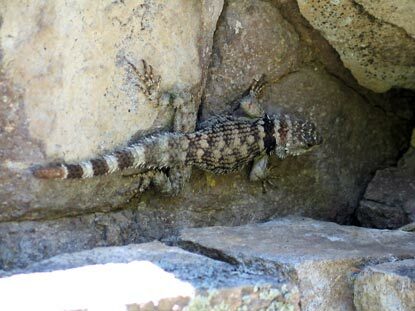 This large crevice spiny lizard (Sceloporus poinsetti) let me get pretty darn close, but not close enough to catch. 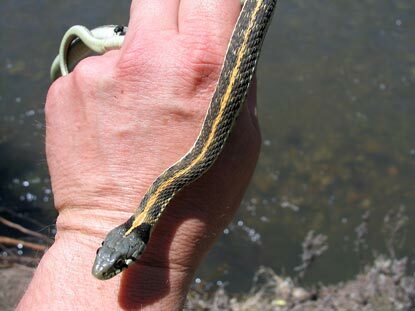 A blackneck garter snake (Thamnophis cyrtopsis). They are associated with water like the terrestrial garter snake. Another blackneck garter snake fresh from a feeding. Congrats on being on Blogger's Blog Of Note! is he a friendly fellow? Lol... I so identified with your reaction to seeing the kingsnake. I felt the same when I got my Holy Grail of vintage American teapots! But having had a gorgeous green iguana at one time, I also appreciate a beautifully colored reptile. What a beauty! hey...my name is staca. i'm from germany. your blog is absolut great. i like it to look your pics of the animals. i can't see them here in germany cause they are rare. we can't see them in nature here. but i think you know! follow your blog - it's cool! Your love and respect for reptiles is wonderful, though I think I would panic were I near them I always like it them. Congratulations for great photos! is this the one from the rhyme? It's the mimic of the one from the rhyme. Red on yellow, dangerous fellow. Red on black is a friend of Jack. At least, that's the one I know, although I don't know any Jacks. There are several variations of the rhyme. They refer to a coral snake, a poisonous relative of the cobra, and the kingsnake you see in the blog. Those are pretty sweet species. NM is infested with reptiles it seems. that giant snake you're holding.."pulled up next to us"... i am now officially naming you "the crocodile hunter of blogger"
Hi . I didn´t can English so much i came from Austria . But i think that your blog is graet . This raptils are beautiful . I think that your Blog is better than my blog !! !=) U are a good Webmaster . i will came back in the near futur !!! i saw a snake once... i picked it up! I waz only 8, lucky 4 me it waznt poisonis! CONGRATS on the king snake find...I am a lover of reptiles although I havent gotten my nerve up to handle a snake yet. Beautiful shot of the snake giving the little girl a kiss. God, This Blog is sooo relaxing! Can U link ur blog to mine, mine is targetting stressed out people, so this Blog can be of relaxation. Great photos!!!! Aren't those kingsnakes poisonousg??? When I was a child in the 50s, we were fortunate to have the opportunities in the summer time to go to the local parks, which we have a lot around us in western Masschusetts. And the rangers would give us classes on the wildlife and bring the snakes out and do a show and tell on them and the local wildlife. May I ask what equipment you use? wow! great photos! did u take them yourself? i wouldn't b able to get that close to those reptiles! Nice Site -- Great pics. Great Pics, Congrats on the blog of Note! 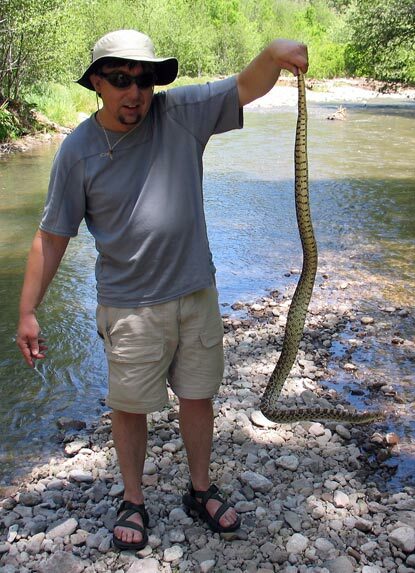 I have been trying to find out how big a common garter snake (Thamnophis sirtalis) can get. I have 6 under my dog kennel cement pad, the largest is over 6 feet long and the girth is about that of a large mag lite flashlight. The first pic on my blog is oof one of them. I love animals including reptiles. My first year of teaching some boys tried to scare me on the playground with a little snake. I was delighted and held the snake much to the dissapointment of my students. Congrats on being a blog of note! As another NM Herper I was excited to see this. Awesome pictures!! I love reptiles. I wish that I lived somewhere where I could take pictures like that. Keep up the good work. Very cool pictures, I really enjoyed them! These photos were taken with a 5-megapixel Canon PowerShot G5. I'm presently using a 6-megapixel Canon PowerShot S3 IS. The largest T. sirtalis I've observed was probably not much over 4'. I went to your blog and saw the picture and can confirm it's T. sirtalis, so yours is the biggest I've seen so far. I want to thank everyone for enjoying the blog and offering the kind words of encouragement. 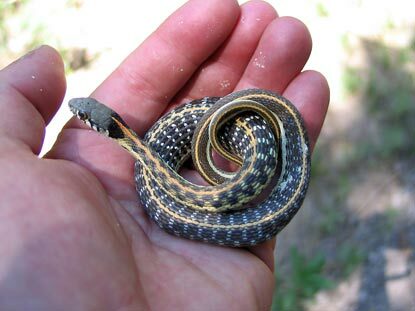 I once rescued what I thought was a baby king snake from my swimming pool. I put it in a jar to show off for a day. Then I got it identified as a coral snake and quickly got it out of my house and back into the wild! Now I need to find the more common king snake! Lucky for you that coral snakes are rather docile. Even if it did bite you, they have a difficult time delivering much of their venom. Who did the ID? It's very easy to mistake a coral for a mountain king. 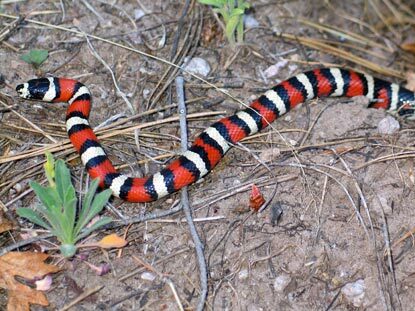 Most non-herping folks assume every black, white and red banded snake is a coral snake, so if it wasn't an expert who did the ID, it could very well have been the kingsnake you thought it was. Thats a great king snake. I want to see one. I'm also a reptile enthusiast. 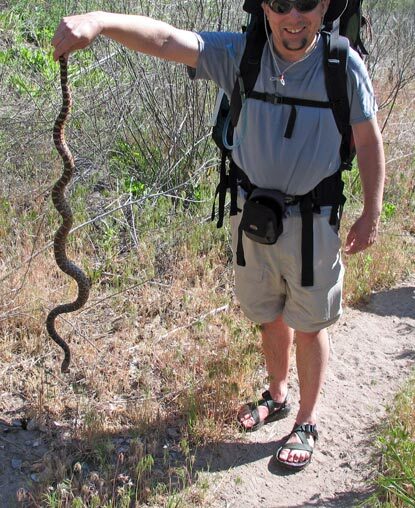 As I type this I'm holding a gopher snake.